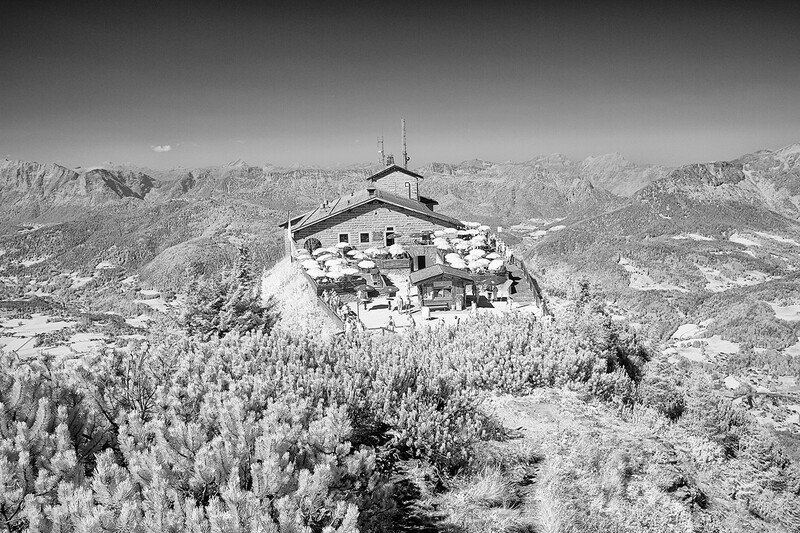 The Kehlsteinhaus was commissioned as a tea room at the summit of the Kehlstein mountain by Martin Bormann and built for Adolph Hitler by Ing. Fritz Todt. Construction was started in 1937 and it was presented to Hitler on his 50th birthday. It is commonly referred to as ‘The Eagle’s Nest’ but should not be confused with Hitler’s house, the Berghof, which was lower down the mountain near the present-day Berchtesgaden Golf Course. Hitler occasionally entertained dignitaries here and treated them to the spectacular views over Obersalzburg but he did not visit very often, preferring to visit ‘The Little Tea House’ at the Mooslahnerkopf beneath the Berghof. On 14 July 1944 Hitler left the Berghof for the last time when he went to the Wolfsschantze, near Rastenberg, just a few days before his attempted assassination by Col. Claus von Stauffenberg. On April 25 1945, almost 400 RAF aircraft bombed the Berchtesgaden area and destroyed the Berghof and its surroundings but the Kehlsteinhaus survived this raid intact. On 4th May the remains of the Berghof complex were burned by retreating SS troops before it was occupied by troops of the US 101st Airborne Division. It, and the rest of the area, was returned to the Bavarian government in 1952. The Bavarian government decided to completely remove all traces of the Berghof but elected to keep The Kehlsteinhaus as it could be used as a tourist attraction giving, as it does, some amazing views from its altitude of 1834 metres. The road leading to The Kehlsteinhaus was closed to the public in 1952 and can now only be accessed by special bus which routes up the narrow, steep winding road to a turning space where the rest of the journey is completed in a large, brass-panelled elevator built into tunnels in the mountainside and travelling a further vertical distance of 124 metres. During the summer it now attracts some 2000 visitors daily.